The productivity series of PLCs comes with 4 built-in communication ports for easy connectivity to your PC or various industrial networks. 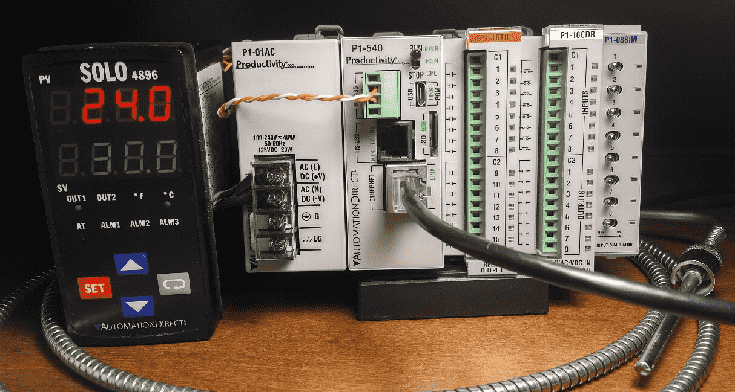 Serial protocols like Modbus RTU can be utilized with either the RS232 or RS485 ports on this PLC. Modbus RTU is an open (published) protocol that uses the Master / Slave architecture. It’s a very common protocol used in industrial automation controls. We will be using the RS485 (2-wire) port to communicate to a Solo Process Temperature Controller. Modbus RTU will be the protocol used on this serial communication media. The PLC will be the master and the Solo process temperature controller will be the slave. You will soon see how the Productivity Series of PLC’s is the best way to handle communication to other devices. Let’s get started. Continue Reading!